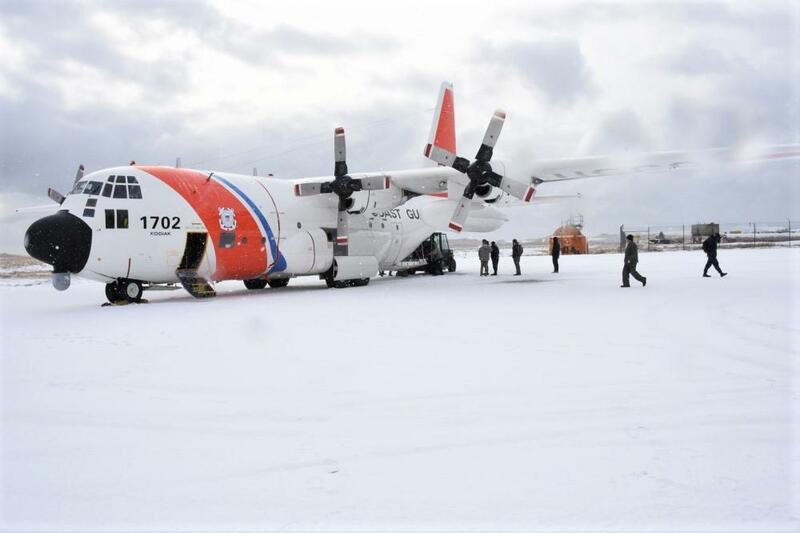 An HC-130 Hercules air crew delivers equipment to the U.S. Coast Guard's forward operating location in St. Paul in February. The temporary base closed recently, as did one in Cold Bay. As the winter fishing season winds down, the U.S. Coast Guard has demobilized its temporary bases in St. Paul and Cold Bay. Last week, the agency announced that helicopter crews conducted 24 search-and-rescue operations during their three-month deployment from Kodiak, with help from the cutters Alex Haley, John Midgett, and Douglas Munro. In total, officials estimated the crews spent more than 110 hours saving the lives of 19 people and assisting 29 others. While pleased with its performance protecting the Bering Sea fishing fleet, the Coast Guard did lose one of its own this 'A' season. The agency is still investigating the January death of a 19-year-old crewman stationed on the Douglas Munro. Ethan Kelch went missing while off-duty in Dutch Harbor and was later found unresponsive on the "west side of Amaknak Island." He was pronounced dead at Unalaska's clinic. Investigators have not yet released any information on what may have caused Kelch's death or whether they suspect foul play. The U.S. Coast Guard has medevaced three mariners in four days from fishing vessels near Cold Bay. On Monday, officials say the F/V Vaerdal was 70 miles north of the community when a crew member reported suffering from chest pains. The Coast Guard Cutter Midgett launched a Dolphin helicopter crew to medevac the man from the vessel and take him to Cold Bay for treatment. Five people were rescued safely from a life raft in the Bering Sea Friday, after their fishing vessel sank about 40 miles west-southwest of Unalaska. The F/V Pacific 1 first signaled its distress to another commercial fishing vessel, the F/V Kona Kai, which relayed the message to the U.S. Coast Guard. "It was reported to be taking on water and listing heavily with five people aboard," said Petty Officer 3rd Class Lauren Dean.